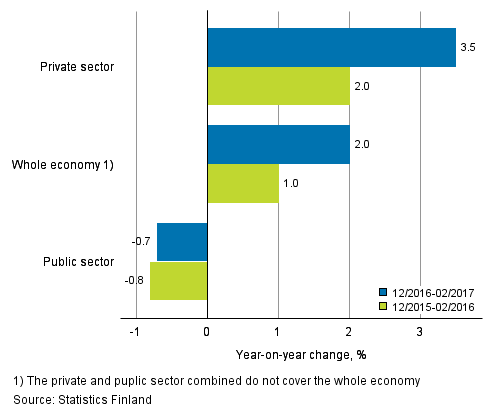 According to Statistics Finland, the wages and salaries sum of the whole economy was 2.0 per cent greater in the past December to February period than in the corresponding period twelve months earlier. In February alone, the wages and salaries sum of the whole economy increased by 1.8 per cent from one year ago. One year previously in December to February the wages and salaries sum of the whole economy increased by 1.0 per cent. In December to February, the wages and salaries sum grew fastest in construction, where the growth amounted to 8.9 per cent from one year ago. 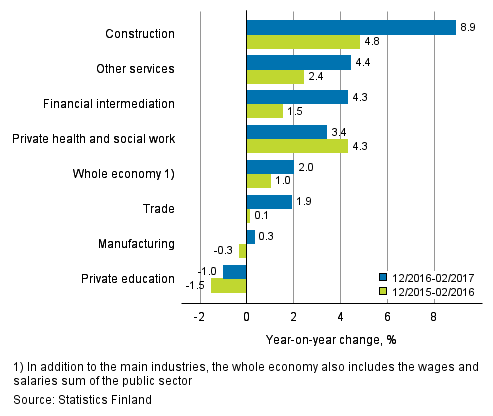 The wages and salaries sums of other services (4.4 %), financial intermediation (4.3 %), private health and social work (3.4 %), trade (1.9 %) and manufacturing (0.3 %) also grew. The wages and salaries sum of private education (–1.0 %) declined from the respective time period twelve months earlier. The wages and salaries sum in the private sector was 3.5 per cent greater in December to February than in the respective time period twelve months earlier. In the public sector, the wages and salaries sum declined 0.7 per cent from twelve months back. In February alone, the wages and salaries sum in the private sector increased by 3.7 per cent from one year earlier. In February, the wages and salaries sum in the public sector decreased by 1,3 per cent from one year earlier. In the December to February period one year ago, the wages and salaries sum increased by 2.0 per cent in the private sector while decreased 0.8 per cent in the public sector. The wage and salary indices adopted new treatment for closures of small enterprises starting from the data for May 2016. This affected the revision of data at the turn of the year and in early 2016. ISSN=1798-6125. February 2017. Helsinki: Statistics Finland [referred: 25.4.2019].